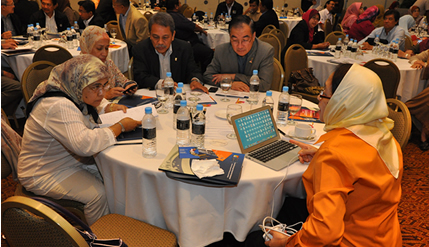 KUALA LUMPUR, 9 June 2012 – Innovation and Entrepreneurship are the keys to putting The National University of Malaysia (UKM) to be among the World’s leading universities by 2018. 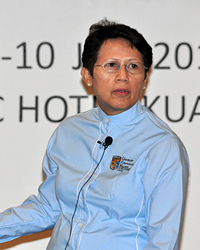 UKM Vice-Chancellor, Prof Tan Sri Dato’ Wira Dr Sharifah Hapsah Syed Hasan Shahabudin said UKM’s mission of transformation is to make it a top choice institution that raises the status of the Malay language while internationalising knowledge of local culture. Speaking at a workshop on UKM In League with the World’s Leading Universities by 2018 and the launch of the Score Card here today, Prof Sharifah Hapsah said the vision of transformation will guide UKM to be a research university on par with the World’s leading universities. With the latest ranking of THES placing UKM 98th of top 100 world universities under 50 years and QS placing UKM 31st of top 50 world universities under 50 years, the university has six years to the achieve the feat. UKM is the only university in Malaysia to achieve this distinction. The objective of transformation is to turn UKM into a world-renowned institution and to contribute to the sustainable development of the country. The workshop which ends on Sunday was organised by its Centre for Corporate Planning and Leadership. She said UKM’s strategy is to identify the talents among the university’s budding entrepreneurs for the purpose of earning revenue through its companies to sell the products and services which they produced. All scientific innovations and technology would be protected by copyright with the participation of the private sector. In this way UKM can generate revenue through innovations and new discoveries. This can be achieved through a transformation plan; Teaching and Learning, Leadership, Talent, Governance and Research and Attachment (Engagement) with private and non-governmental organisations (NGOs) and government agencies. Every academic staff is encouraged to undergo attachment programmes once within the first 10 years of service. Academic staff who have served more than 10 years are also urged to take part in the scheme subject to the approval of the Human Resources and Planning in the university. She likened UKM as a seagull flying towards its destination but on the way faces many challenges. However, she said as long as UKM is fully prepared with the right tools, it will reach its destination. UKM, for example, needed to participate in national development and gain prominence at the international level, while research studies must be done to be the catalyst in the process. The journey must also have an efficient delivery system so as to turn Malaysia into a high-income nation with a satisfactory quality of life by 2018. To keep track of this journey, UKM also needs a Score Card to record its achievements in every operational aspect along the way. Prof Sharifah Hapsah reminded faculties to inspire their undergraduates to achieve the vision with scholars encouraged to take part in more co-curricular activities, such as entrepreneurship and innovation. As such, students who do manage to invent new products should receive all the backing necessary to protect their creations through copyright and intellectual property registrations. They have to consult the private sector and lawyers. The Vice-Chancellor assured UKM’s academic staff and students to act freely but responsibly in their respective capacities following it being given autonomy.